Welcome to the web site for Boy Scout Troop 106, Huntington, Long Island New York. Troop 106 has been helping boys become responsible citizens of good character and personal fitness since 1954. We are sponsored by the Huntington Elks Lodge #1565. 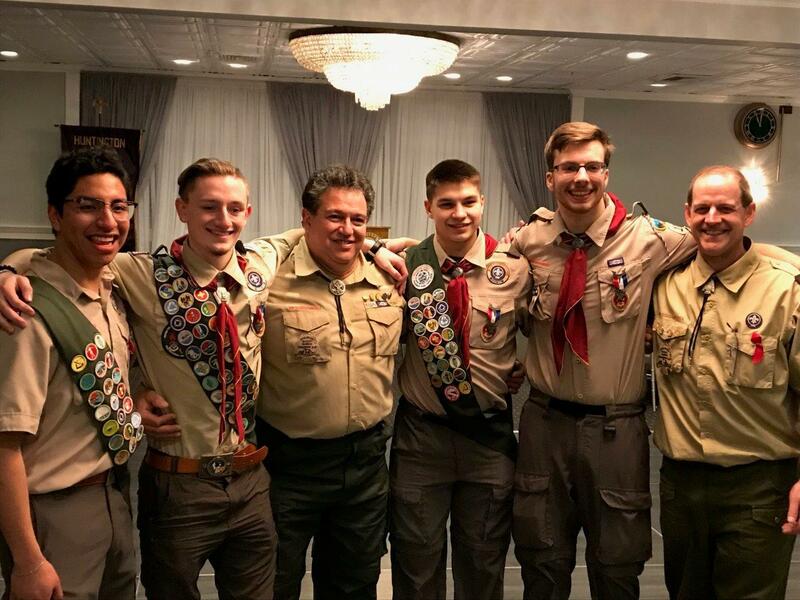 Congrats to our recent FOUR Eagle Scouts!!! We have activities every month throughout the year. We always welcome new scouts to join the troop and enjoy the weekly meetings, advancement, monthly camp outs, hikes and trips. Our weekly meetings are at Paumanok Elementary School. The school is located at 1 Seaman Neck Road, Dix Hills, New York. Our meetings are held on Tuesday nights from 7:30 until 9 pm. whenever school is open. Every month we spend a weekend together as a troop and go do something fun such as camping, hiking, rafting, fishing, climbing and and lots of other activities. We have age appropriate activities for all ages of scouts. Our scoutmaster is Mike Terrone (mterrone@yahoo.com). If you are interested in joining, you can come down any week to see what Troop 106 is all about. Email us here with any questions you have regarding our troop and its activities. If you would like to Join or know more about us, please browse around or use the Contact Us link to get in touch with one of our leaders.